The Walking Dead S7 clip shows the aftermath of Negan’s attack! ‘Right-hand man’ reveals spoilers for season 7! New York Comic-Con has debuted a preview clip from the upcoming sixth season of The Walking Dead, revealing spoiler: Rick survives… for now at least. The clip shows an intense exchange between Negan (Jeffrey Dean Morgan) and Rick (Andrew Lincoln) immediately after Negan has brutally killed one of the group. It’s not revealed who, but it’s heavily hinted to be his right-hand man – which I think most would consider (dare I say it) to be either Daryl or Glenn? As two of the most popular characters on the show it would certainly fit with creator Robert Kirkman and the showrunners comments at the NYCC that the victim will be someone of importance to the group and audience. Reiterating, people will not be relieved by this death: “We can’t have that,” Kirkman said. 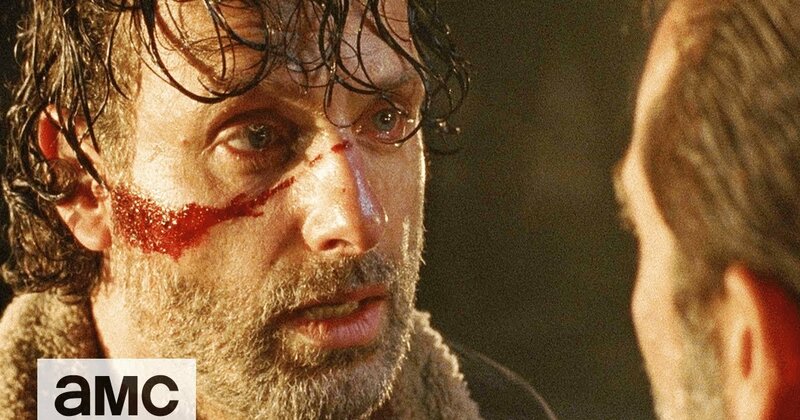 Rick is seen promising Negan: “Not today, not tomorrow… but I’m gonna kill you.” he’s then hauled off by an axe wielding Negan. (Spoiler: This is most likely the point Rick will lose his hand, as he does in the comics; except in that instance the Governor took his hand). Whoever Negan’s victim is, I’m sure most will just be glad after months of speculation it’s finally out there. However, if it is Daryl or Glenn, I will be very sad (and annoyed) to say goodbye to Norman Reedus or Steven Yeun. The Walking Dead Season 7 returns in America on AMC on October 23, with FOX UK airing the series on Monday, 24th October.